Who among them can declare this, and show us the former things' ' Man, know thyself' is perhaps one of the world's oldest and most important sayings. This adage was originally coined by Imhotep, the word's first and only multi - genius and one of the greatest persons who ever lived. What Imhotep meant in short, was that we should know who we must become. This is the message of the Sankofa symbol that we must look back in order to go forward. 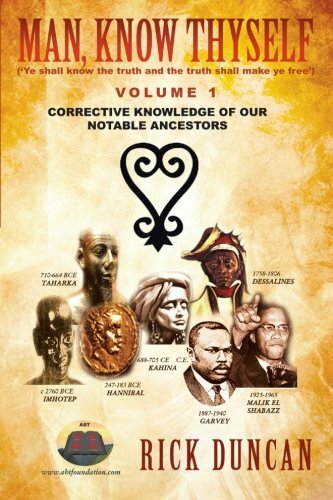 Knowledge of our past therefore is of crucial importance. We cannot go forward if we do not know who we presently are. We cannot know who we are if we do not know who we have been. If we do not know who we were, we cannot know who we must become. Our story has been written and told by others who claim their knowledge of us as 'truth' Their stories of us have determined who we are. Having ingrained such false knowledge about us, we cannot know ourselves and therefore who we must be. Why have we allowed other s to tell us of our past? Why have we allowed others to determine who we are? How can those who do not know about us, tell us about us? Why have we allowed others who do not know the truth tell us the truth of former things?